Nate Coyne first became interested in music while listening to his father’s records in the basement of their home in New York's Capital District. Artists like Chicago had particularly staying power in his imagination. His formal training began with percussionist and educator Matt Cremisio while Coyne was in high school. Cremisio introduced the young Coyne to many drum legends of the jazz tradition such as Elvin Jones, Art Blakey, Buddy Rich, Philly Jo Jones and Max Roach. 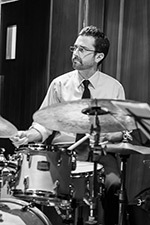 The Crane School of Music in Potsdam, NY accepted Coyne into their undergraduate program in 2003, and he studied classical percussion, jazz, and Latin music. While enrolled he had the pleasure of studying with Jim Peterscak, Bret Zvacek while continuing his drum set studies with Cremisio. He also had the opportunity to work with guest artists including Fabrice Marandola, Greg Runions, Chris Washburn, Kurt Elling, Gene Bertoncini, Dean McNeill, and Hubert Laws. In his junior year Coyne was asked to be student conductor of the Crane Latin Band where they took part in clinics with Bobby Sanabria (Tito Puente, Mario Bauza) and toured in Monterey, Mexico. 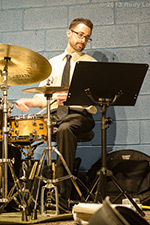 Coyne then taught in the Shenendehowa Central School District in Clifton Park, NY before heading out to the west coast to complete a graduate degree in jazz and percussion at the California Institute for the Arts (CalArts) in Los Angeles. It was here that Nate had the opportunity to study privately with Joe Labarbera (Bill Evans/Chuck Mangione), Aaron Serfaty (Arturo Sandoval) and David Roitstein (Jaco Pastorious/Pat Metheney). Being involved in both jazz combos and numerous other groups, Coyne was heavily involved in Afro-Cuban music and arranging at CalArts. He spent much of his time transcribing and arranging music for jazz combos and salsa band for which he was a part of. His professors were major proponents of the music like Charlie Haden, Vinny Golia, Larry Koonse, Darek Oles, Alfred Ladzekpo and Wadada Leo Smith. Now back in the Capital District, Coyne performs regularly with locally with Keith Pray, Brian Patneaude, Dylan Canterbury and the Joey Thomas Big Band. He also runs his own group The Nate Coyne Quintet while teaching music in the Troy City School District.